Perhaps you remember a previous post about the quilled Quaker Marriage Certificate I created for a former student and her fiancé. Well, what a nice surprise... an engaged couple came across that entry this summer, liked what they saw, and emailed to ask if I would do a similar certificate for their September wedding. Of course! Elizabeth and Bill commissioned calligrapher Carole Foster of Running Dog Letters to hand letter their document. Not only did Carole do an incredible job with the script, she also embellished the header with a graceful flourish of doves. Liz and Bill requested I quill a similar design to the one I'd created for the first certificate, but with black filigree. Ordinarily I prefer to quill a different motif for each project, so even though I went with a similar curved design, I altered some of the floral elements. I also suggested adding a bit of silver-gilded black paper to heighten the dramatic effect, showing them black and silver paper quilling examples. When the certificate was shipped, I included a provenance paper... if you aren't familiar with this practice, it's an artist-signed document that can be kept with the art work or separately. It tells when and where the piece was made and by whom, and gives a brief description and materials used. 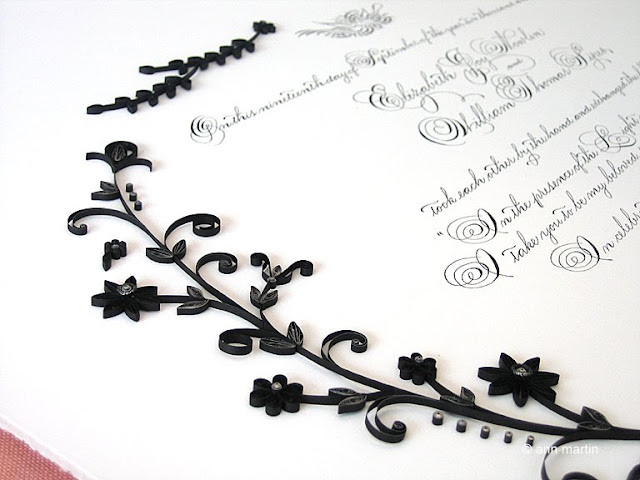 I also like to include a short history of paper filigree. A provenance paper is a simple touch that makes what may someday be an heirloom piece that much more valuable. Recently Elizabeth forwarded pictures of the wedding to me. How nice it was to see photos of the guests adding their signatures to the lines Carole had penciled below the wording. Best wishes, Elizabeth and Bill! Really elegant, I love it! Molly, the gilded black paper is from Jane Jenkins - it has such a nice shine. Not positive about this without checking her site, but I think she will gild any color you want as a special order. The black with silver or gold is one of their standard papers though. Ohh! So elegant and the design is perfect for the script! I love the black gilded I will have to purchase some to play with! Thanks for sharing. This is so beautiful Ann - truly a family heirloom to be treasured by the present and future generations. Oh, my. So beautiful. 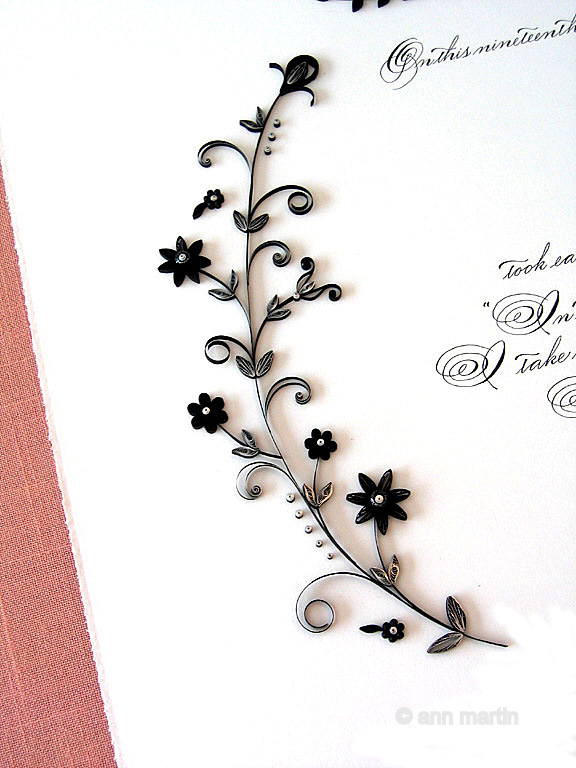 I adore the look of the black filigree. Is this the paper from your last order??? Thanks, everyone! Yes Denise, the paper was from CQ. Black, white and silver make for an elegant certificate! I love all those filigree shapes/flowers and I love how you have used symmetrical patterns at the top and asymmetrical designs at the sides...giving a great contrast. I am sure E & B will treasure this masterpiece! Ann!! It´s so gorgeous and elegant as every quilling work you do!!! Wow - very striking! You always do such lovely work, Ann. Both the quilling and the lettering are beautiful!! 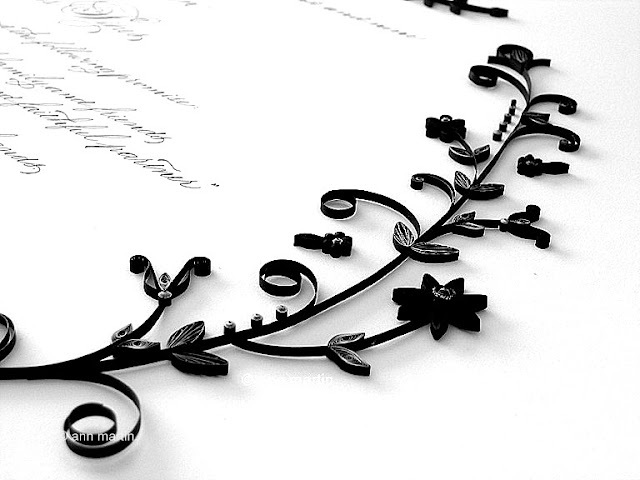 Ann - Love, love, love the black filigree! So stylish and so perfect with the calligraphy. Beautiful work. That's really lovely. Thanks for sharing.